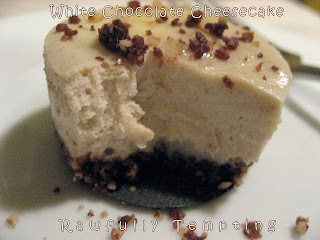 Google+ Rawfully Tempting™: White Chocolate Cheesecake - Happy Anniversary W!!! White Chocolate Cheesecake - Happy Anniversary W!!! I made this over the holidays for my family and my daughter thought it was such a hit, she declared, "Mom, Mom...you need to sell these..seriously, they are amazing...and no one has to know they are healthy." Although, I wished she were more enthusiastic in appreciating the healthy factor as a positive thing, I still took what she said as a huge compliment. I just re-created the recipe for my 6th anniversary with W, and it came out super light and fluffy. These were created in MINI cheesecake molds, and each one is about 1.5 inches in diameter...kinda like "dessert sliders." I'm thinking of doing a selection of 2-3 flavors as a dessert for dinner guests. How elegant would that be! I'm not posting the recipe for these yet, as it needs a bit of tweaking, but I can tell you the base is cashew, macadamia, Irish moss paste and a few other goodies. The crust is almonds, dates and cacao powder. However, I could not have achieved the exquisite white chocolate flavor without the help of Medicine Flower White Chocolate Extract. YUMMMers! And for my Rawfully Tempting friends, Medicine Flower offers a Special Bonus Sample if you mention "Rawfully Tempting" in the Shipping Comments of your order. 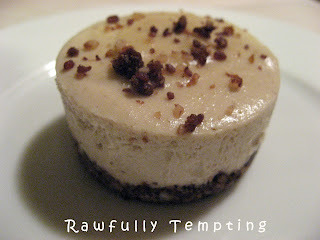 omg that looks sooo good, can't wait for the recipe! yum! i LOVE white chocolate -- especially in cheesecakes!! ... pure decadence! Hanounaa - tweaked? Not sure what you mean..sorry.